Window Film is available in a wide variety of types and styles! If you are looking for a way to lower your energy costs with a minimal investment and huge returns, window film is your answer. Keep reading to learn more about window film. Regardless of your needs, window film has a solution for everyone. Some of our window films include energy savings, glare reduction, anti-graffiti, security, and UV fade protection to name a few. This image is an example of our energy saving window film. In addition to saving money on your energy costs, it also reduces glare from the sun, eliminating the need for blinds. If you have wood floors in your home that are exposed to sunlight, UV fade protection film can help protect them from fading in the sun. Window film can block up to 99% of the harmful UV rays that fade floors and furniture overtime. Since window film is economical, installing window film is an easy decision that can help your floors and furniture last up to twice as long. 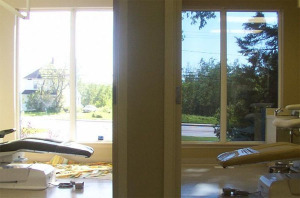 Residential window films offer several money-saving benefits. Case studies show how real customers were able to save money with window film. If your considering window film for your commercial space, here are some of the ways that you can benefit. Security window film can prevent your windows from shattering in the event of vandalism or burglaries. Decorative window film can provide branding, style, as well as privacy. Anti-graffiti window film makes graffiti cleanup costs simple and economical. Energy saving window film is the perfect solution for cutting your energy costs. If you’re interested in learning more about actual customers stories, our commercial case studies show the benefits of businesses that have installed commercial window film. For school, government, and public buildings, the benefits of window film are amazing. Energy saving window film is most commonly known. However, there are many other window films that provide amazing benefits. Decorative window film can display school or government seals and also provide a certain level of privacy with a decorative flare. Security window film give your building added protection from break ins by making sure your windows glass doesn’t shatter. Anti-graffiti window film makes graffiti or vandalism costs much easier and less expensive. Our case studies will give you a closer look at actual situations where window film has helped. If you would like to learn more about window film, contact us today.